Our work is low paying, unsecure, and appalling. We are working less and less with what is beneficial to us, but spend more and more time fighting with our bosses and the state. Whoever doesn’t come to terms with this misery runs away to the West. However, analysis shows that even there it will soon be even harder to make ends meet. Aristotle was afraid that the machines would eventually replace people. You don’t have to be an ancient genie to realize the fact that new technology may leave you without work – such as the notorious rebellions by Luddites who destroyed machines to save their jobs. Industrialization changed the labor market. First it replaced highly skilled craftsmen with low skilled laborers with the use of machines. After the introduction of machines, the need for maintenance workers was created to keep the machines working. Unlike the craftsman, however, today’s specialists don’t create the end products which are instead products of the machines. Through the last decade, the increased involvement of computers into production also changed the labor market. Studies show that this has led to the loss of middle and lower class jobs, which has led to the creation of a U shaped curve with many lower class jobs and upper class jobs, but few in the middle class. Today, computers are in charge of many tasks that demand precision in factories, armies, schools, and in offices. There is no period in history in which machines have been able to do as much work compared as human laborers. However, trends in collecting and analyzing large amounts of data that was until recently missing or unanalyzed created new industries which at this point cannot continue without computers. Tasks which ten years earlier were dismissed as work that cannot be done by robots, such as driving in urban areas, are today seen otherwise – self driving cars are already being tested on the streets of Florida, California, and Nevada. Researchers at Oxford university have calculated how the latest trends in machine self-training and mobile robots will affect the labor market. They distinguished 3 difficulties in front of the computerization of tasks – “knowledge and management of the field”, “creative intelligence”, and “social intelligence”. Data from the Ministry of Labor in the USA determined 702 professions, whose difficulties can be quantified. With help from various experts in mechanization, they determined 70 of these professions that can easily be fully automated with today’s technology. The resulting models are with 90% certainty able to measure whether certain profession will be fully automated or not. According to the results of the model, for 47% of these professions (which currently employ 68 million people) there is a 70% certainty that they can be fully automated with modern technology. Also, those professions with a 30% to 70% chance of automation are certainly going to rise because “knowledge and management of the field” is the most improving of the previously mentioned difficulties. The most affected will be “most workers in the transport and logistics industry, along with many office, administrative, and production fields”. The service industry, in which many USA jobs have been recently created, is also very susceptible to automation. Unlike the last decade where middle class jobs were lost, the first ones to be automated and lost will be lower class jobs. There is no reason to think automation will not affect work places outside of the USA. Wages in countries such as China are undoubtedly lower, but in long term machines are always cheaper, compared to real workers. To be able to find jobs, we must first find work what machines cannot do, or be forced to compete with them. There is no way we can all become dentists or drive goods 24 hours, day and night. In 1589, the priest William Lee invented the first sewing machine with the hope that it would free workers from sewing by hand. When looking for a patent to save his invention, he showed it to Queen Elizabeth the First. But the queen was very worried about the situation. “Think about what your invention would do to my poor subjects! It will surely destroy them when it leaves them without work, and it will turn them into beggars.” She denied his patent. William Lee was forced to leave the kingdom. Half a millenium later, in our so called democratic societies, the situation is the same. Robots continue to work more, but instead of us working less, we are becoming more and more redundant. Why is something that is supposed to improve our lives instead making it more difficult and unsecure? When ownership over the means of production (resources, machines, and more recently technology) is concentrated in the hands of the few, the people receive a share based on how much they can sell their labor. If somebody cannot sell their labor, they must rely on the good of others who have more in order to survive. Today, when few are without work, aspects of society such as social, health insurance and pension funds work as distribution of excess, so that nobody dies of hunger. But the time is coming when a large part of us (according to the study, close to half of the population in the USA in the upcoming decades) will be cheaper than the food they need. The machines will create even more than today, but it won’t be ‘right’ for us to use what they produce because we haven’ worked or sold our labor for it. What will we do then? 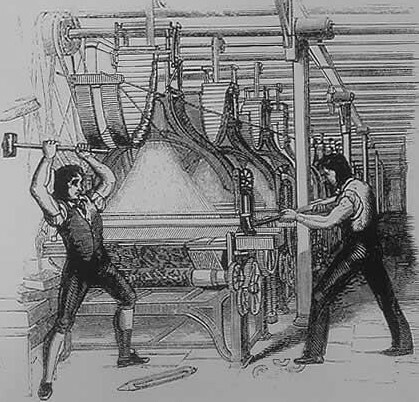 Will we destroy the machines like the Luddites? Will we chase out the inventors like Elizabeth? Do we love work so much that we don’t want machines to do it instead of us? Barely. Technological progress gives us opportunities to work less and less, and to create more. Instead of this, however, the need to sell ourselves on the “labor market” threatens to ruin us. The only decision is to remove this market, the removal of ownership over our natural resources, technologies and robots, distribution of resources based on the needs of the people. We are valuable because we are people, not because we work. Only then will we be secure in our futures. We will surpass the monotony of work, the repetitiveness of every day, and the shorter days with more creativity. Originally written by the Federation of Anarchists in Bulgaria. Translated for Theory Without Borders.